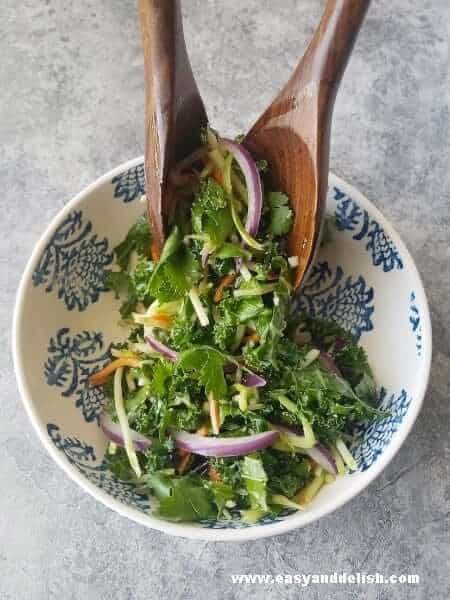 Brazilian Homemade Coleslaw (kale slaw) is a fresh, colorful salad made with kale, onions, and coleslaw mix, tossed with a lime-garlic vinaigrette. A must for all year round, including as a side for barbecued meats and sandwiches. 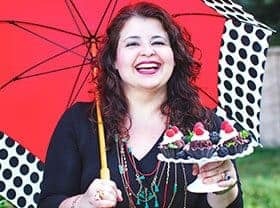 A salad that you can toss quickly and serve the whole year round? Well, how about making it a Homemade Coleslaw? Coleslaw is nothing more than a “cabbage salad,” and there is a cabbage type for every season of the year. Do ya see?! As Wikipedia explains, coleslaw comes the Dutch term koolsla (meaning ‘cabbage salad’). Also known as cole slaw or slaw, it consists primarily of finely-shredded raw cabbage tossed with either a vinaigrette or mayonnaise. Of course, one encounters variants in many different countries. In America, coleslaw typically consists of a mix of cabbage and carrots tossed with a buttermilk or mayo dressing. If Brazil had its own version, it would no doubt include one of its most popular leafy vegetables, kale, which is a close relative of cabbage! 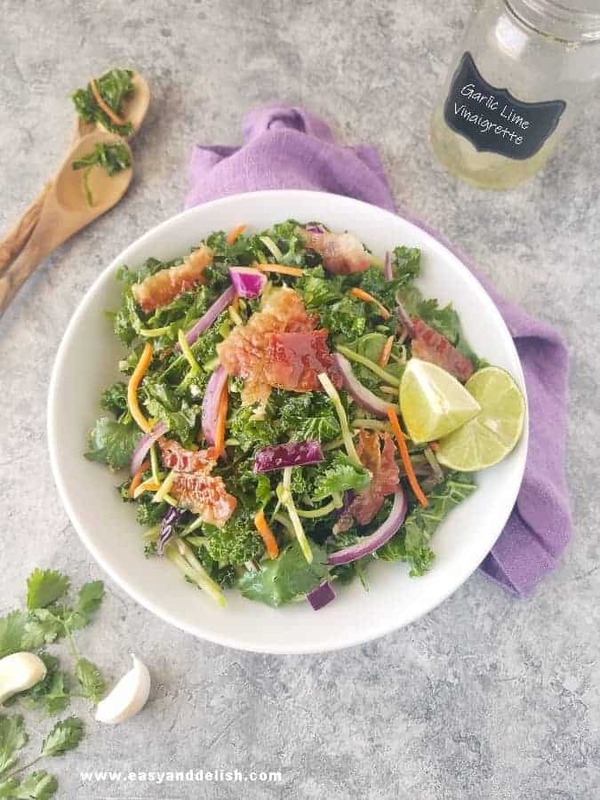 This Brazilian coleslaw (kale slaw with bacon) mixes finely-shredded kale (just as in Couve a Mineira) with cabbage, carrot, and red onions… all tossed with a lime-garlic vinaigrette. The vinaigrette makes this slaw lighter and grants it a longer lifespan. Plus, the acidity aids digestion when served as a side for Brazilian barbecue. 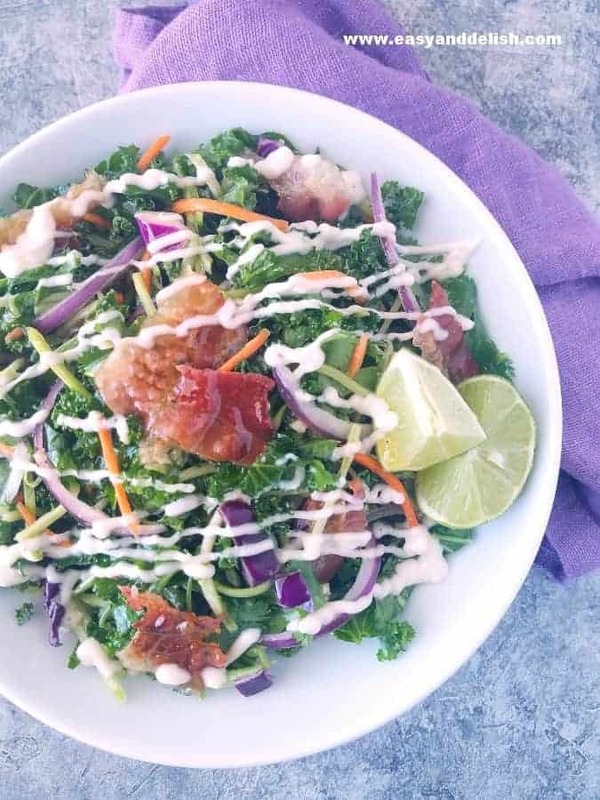 But if you prefer to, serve this kale slaw with a mayo-based dressing instead. Homemade coleslaw is a side dish that usually accompanies fried chicken (an all-season dish) and barbecued meats (summer season). It is also used in sandwiches such as the Rachel (a variant of the Reuben) and on hot dogs. Well, let’s learn how to prepare this Brazilian coleslaw! 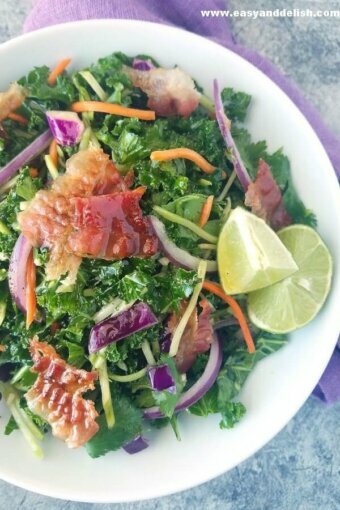 Combine finely-shredded kale, chopped red onion, coleslaw mix (with red cabbage and carrots), and bacon if desired in a large bowl. 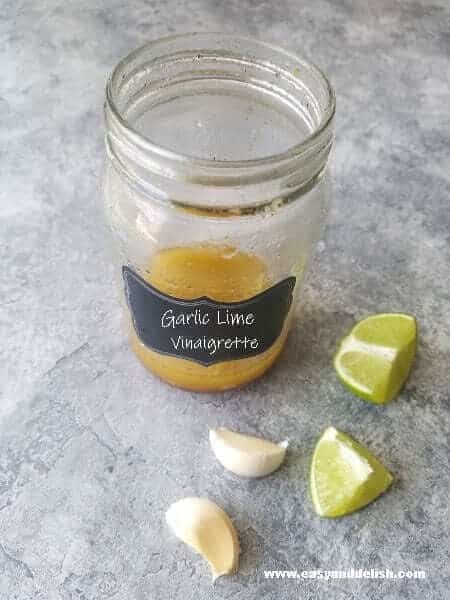 Add olive oil, lime juice, vinegar, minced garlic cloves, honey or sugar, salt, and pepper in a jar. Seal and shake until well combined. Toss salad with vinaigrette and serve in sandwiches, on hot dogs, or with barbecued meats. Wash the kale (or collard greens) under cold running water. Shake to remove the excess water. With a sharp knife or your hands, cut off the leaves from their tough stems. Gather the leaves together into piles. Take each pile and roll it tightly. Cut them into thin strips crosswise (about 1/4-inch strips). Brazilian Homemade Coleslaw is a fresh, colorful salad made with kale, onions, and coleslaw mix, tossed with a lime-garlic vinaigrette. A must for all year round, including as a side for barbecued meats. 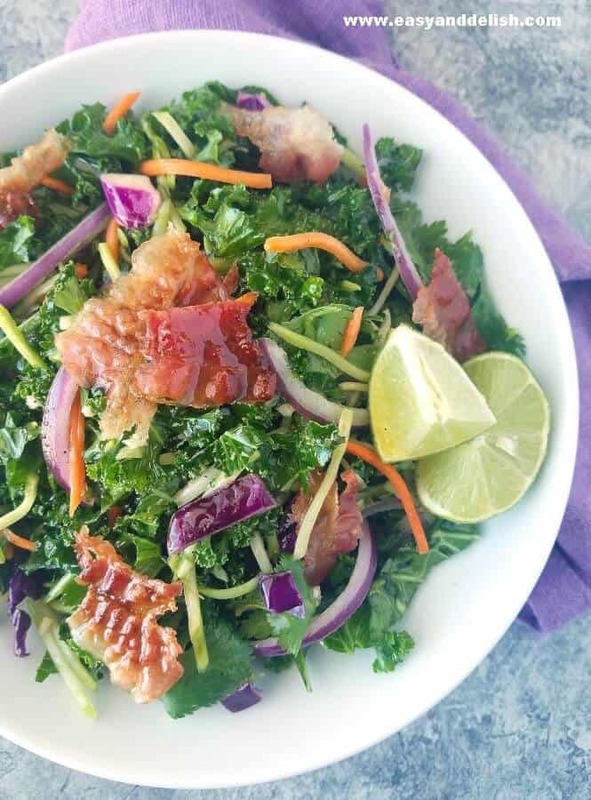 Combine finely-sliced kale, red onion, coleslaw mix, cilantro/parsley, and bacon if desired in a large bowl. Add olive oil, lime juice, vinegar, minced garlic cloves, honey or sugar, salt, and pepper in a jar. Seal and shake until well combined. Toss salad with vinaigrette. Serve in sandwiches, on hot dogs, or with barbecued meats. 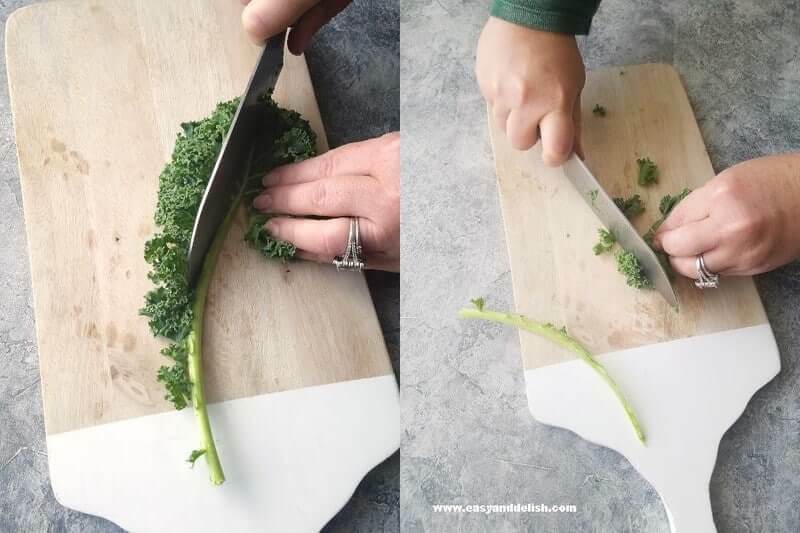 HOW TO CLEAN AND CUT KALE: Wash the kale (or collard greens) under cold running water. Shake to remove the excess water. With a sharp knife or your hands, cut off the leaves from their tough stems. Gather them together into piles. Take each pile and roll it tightly. Cut them into thin strips crosswise (about 1/4-inch strips). If you prefer a mayonnaise-based dressing instead, replace olive oil for a good-quality mayo (1/2 cup) and skip the red wine vinegar. Follow the rest of the recipe whisking all the ingredients for the dressing very well. Love greens? Try our warm Pan-Fried Collard Greens. Yummm. Healthy coleslaw without the guilt! You cant beat a nice juicy burger with a creamy coleslaw! The lime-garlic vinaigrette makes this slaw sing! This would be fabulous for Super Bowl Sunday with pulled pork sandwiches.